This Instant Pot Pasta makes an easy and tasty vegetarian weeknight dinner the whole family will love! It’s back-to-school time and I already miss the easy summer schedule. The throwing together of dinner–a salad with all the fresh things we have and maybe some grilled chicken. If there’s no time for that, a can of beans will add some protein. Whatever it is, it’s quick, and not usually planned. But back-to-school time? It’s different. The activities start. Schedules are back in place and dinners become planned again. All I can say is these dinners need to be easy. Family dinners are a priority for this family, but with our busy schedules they can’t be too complicated. 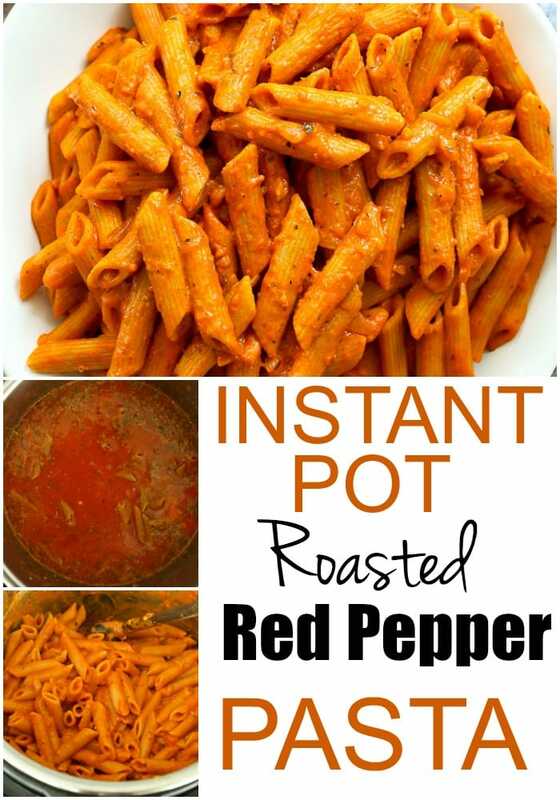 That’s why I love this Instant Pot Pasta. It’s made with mostly pantry ingredients and you can easily prepare a side salad while it’s cooking and you’ve got yourself a healthy dinner. In less than 30 minutes. That’s what I’m talkin’ about. Let me show you how easy it is to make this Instant Pot Pasta! In a blender, blend the roasted red peppers from a 16 ounce jar along with two tablespoons of the liquid from the jar. Set aside. Turn the Instant Pot to sauté mode and sauté 1/2 large diced onion and 1 tablespoon minced garlic in 1 tablespoon butter. Sauté for about 5 minutes, until the onion is softened. Press cancel. Add the pureed peppers, 4 cups of vegetable broth, 1 tablespoon Italian seasoning blend, 1 teaspoon salt, and 1/4 teaspoon black pepper to the Instant Pot. Stir. Add 1 pound whole wheat penne pasta. Please note that I haven’t tried this particular recipe with regular pasta, but the time will likely be less than with whole wheat pasta. Turn the Instant Pot on high pressure for 8 minutes. Allow it to have a natural release for 5 minutes, and then do a quick release. 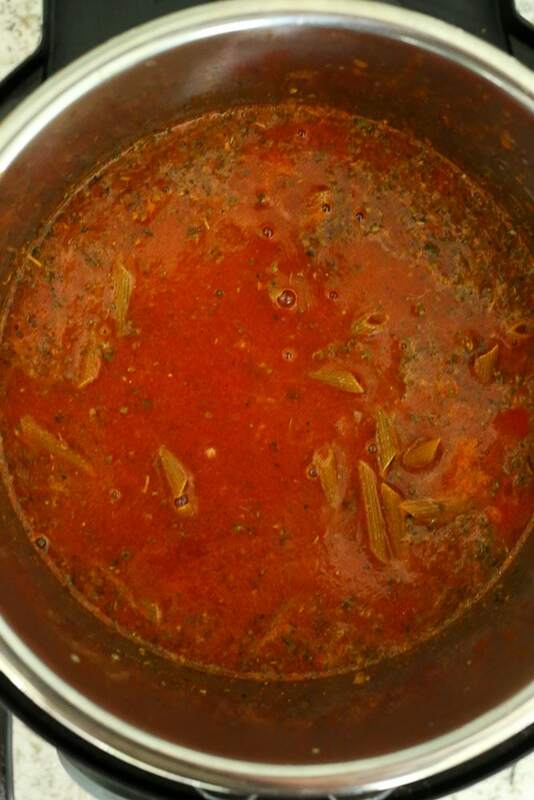 This is how the Instant Pot pasta looks after cooking, before stirring. There was a lot of steam so getting pictures was tricky! Stir in 1 cup of crumbled goat cheese. Roasted red peppers and goat cheese is such a great combination. I hope you love this as much as we have! If you love cooking with your Instant Pot, make sure to grab my Instant Pot Cheat Sheet for easy reference of popular cooking times! 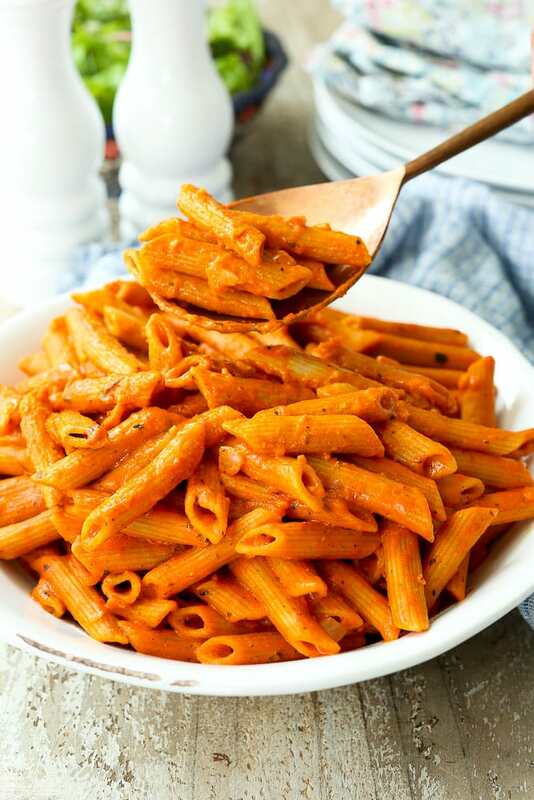 This Instant Pot Pasta is made with whole wheat penne, roasted red peppers, and made creamy with goat cheese! It’s a healthy and delicious vegetarian dinner that’s perfect for busy weeknights. Add the pureed peppers, 4 cups of vegetable broth, 1 tablespoon Italian seasoning blend, 1 teaspoon salt, and 1/4 teaspoon black pepper to the Instant Pot. Stir. 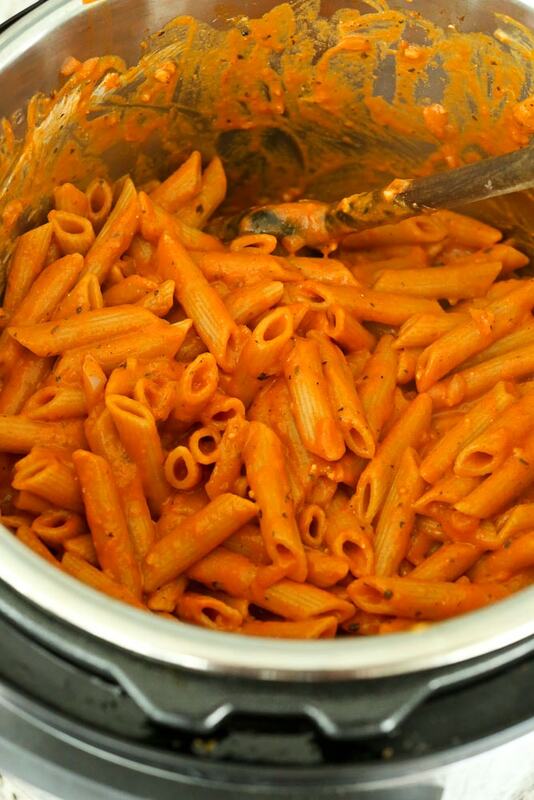 Add 1 pound whole wheat penne pasta*. Stir in 1 cup of crumbled goat cheese. Serve and enjoy! 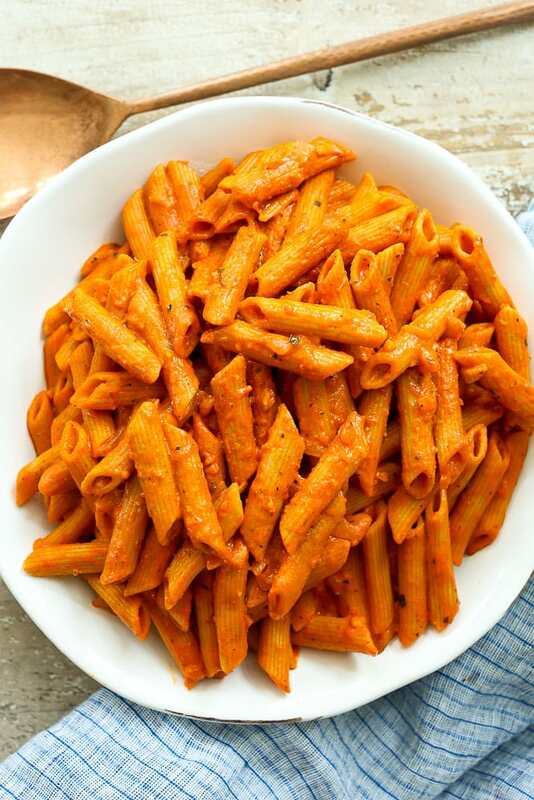 *I haven’t tried this particular recipe with regular pasta, but the time will be less than with whole wheat pasta. I would try 4-6 minutes. If you love cooking with your Instant Pot, make sure to check out my collection of healthy Instant Pot recipes! I highly recommend this recipe for Instant Pot Coconut Lime Chicken Bowls, as well. 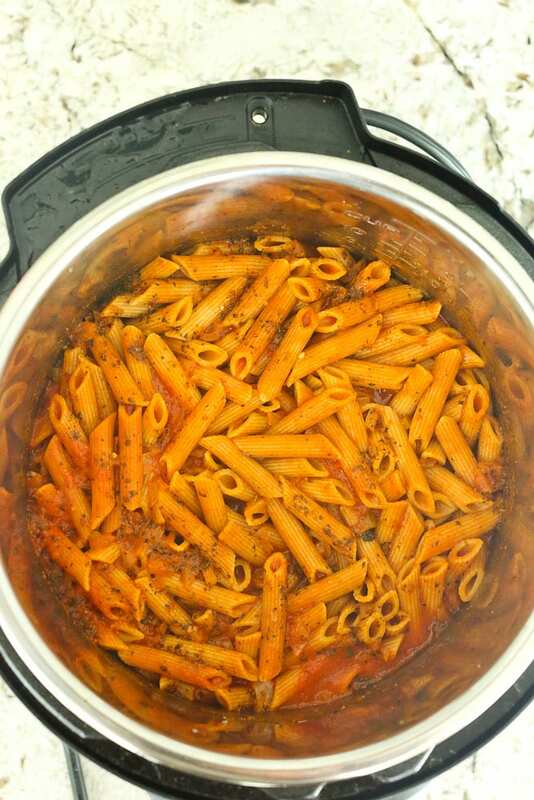 If you try this Instant Pot Pasta recipe, would you mind rating the recipe with stars when you leave a comment? It’s VERY helpful for me and other readers if the recipes have ratings and reviews. I appreciate you! Links to products are affiliate links. Thanks for your support!